The year was 1990, and quite frankly, Felipe Hernandez needed a job.“Everyone had always loved our family’s tamales, and I decided, why not open a restaurant that features tamales. I’d get to do something I love, and hopefully, we’d have enough customers to make a living,” he stated. Felipe learned the recipe from his sister Leocadia Sanchez, and the rest as they say is history. He named the restaurant Los Hernandez Tamales, and he started making tamales with other family members – and a reputation was quickly made. Their process starts with mesa, and Los Hernandez mills their own from dried corn, one of the unique attributes of their delicious tamales. They then hand prepare each tamale, by spreading the mesa on the corn husk and adding the appropriate filling. There is an art to properly creating a tamale, and the Los Hernandez crew has it down to a science, able to make 120 dozen tamales in under four hours. we have fans from the Northwest, the U.S.
Hernandez quickly discovered some other innovations to improve their process. 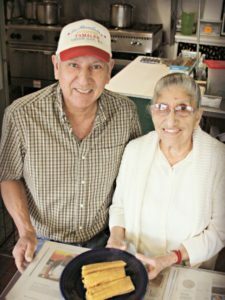 “I thought our best tamales were those that we were able to stand upright in the pots, I customized all of our pots and it gave us a unique cooking method that I believe helps in our consistency of flavor,” he said. Their business was steady, and then they decided to throw a little twist into their tamale making. “We live in a region known for growing amazing asparagus, and I love asparagus, so we started experimenting with fresh asparagus and various cheeses, and eventually settled on an asparagus with pepperjack cheese tamales,” stated Hernandez. It turned out Hernandez wasn’t the only one who loved asparagus. So did their customers. The word quickly got out that Los Hernandez Tamales in Union Gap, WA had this wonderful seasonal product, and people started showing up from all over the state and beyond. They even had international requests for their tamales. They had so much demand for these tamales, that they’d have to post ‘sold out’ signs when that day’s supply was gone. Since that time, Los Hernandez has continued to build on their reputation as the premium tamale in the region and the state. In 2014 they introduced their jalapeno and pepperjack cheese tamale, which is now another popular seasonal product. Hernandez would like to take a moment to thank you for visiting their website, and hopefully you’ll come by the store for some fresh tamales, or, give them a call and place an order for them to ship you some. What started as a family business in 1990, is still very much a family business today. Hernandez’s wife June, is very involved with the business, as is his daughter Rachel who heads up all the marketing efforts, and her husband runs production. 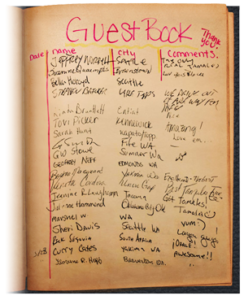 There’s a small staff made up primarily of family and friends with a passion for providing customers with a great eating experience.